New Inventory Added Daily So Check Back Often! We Now Accept Credit Cards! Have you ever wanted to try a different bit on your horse but didn't want to spend the money for an expensive bit that you weren't sure your horse would like? Do you have a bit laying around that didn't work that you would like to sell? Would you like to try a bit before buying it? 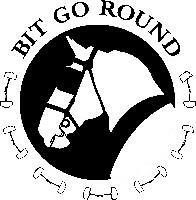 I came up with the concept for Bit Go Round after purchasing a variety of expensive bits for my driving horse that he was not comfortable with. After accumulating a tack room full of bits I would never use, I decided there had to be a better way to try a bit without spending a fortune only to find out it wasn't going to work. Hence, Bit Go Round was born. As people learned of my business, they asked me if I could sell their bits and other equipment, saddles, tack, gift items, anything and everything horsey! That's how Bit Go Round got to where we are today. At Bit Go Round, all items on my website have been consigned for sale unless otherwise noted as NEW. If you can ship it to me, I will list it on my website for sale. You determine the selling price. If you see a bit you would like to try, simply add it to your shopping cart. You will be charged the full price of the bit plus shipping. Try the bit for 14 days. If you are not satisfied with the results, ship it back in the same condition you received it in and I will happily refund the purchase price less a $5.00 restocking fee, no questions asked. Should you decide to keep the bit, no further action on your part is required. It is yours to keep. The 14 day trial period only applies to bits. All other items are final sale unless otherwise noted. Please feel free to call or email with questions regarding any item listed on this website. It's that easy! All of the used items listed for sale on Bit Go Round are in excellent or like new condition so you can buy with confidence knowing you are buying a quality product. If any item listed has a flaw, it will be fully disclosed in the product description. My commission is the lowest in the industry. I charge 20% on items priced under $1000. For items over $1000, my fee is reduced to 10%. I hope you will consider consigning your unwanted, unused tack. Let me make your unwanted tack work for you. In addition to the consignment items, Bit Go Round carries a limited amount of new items. This will be noted in the product description. We are partners with several wholesale distributors so if you don't see what you are looking for on our website, email or call us. We will be happy to give you a quote and special order what you are looking for, everything from grooming supplies to wormers, supplements, tack, etc. The possibilities are endless! We are excited to announce Bit Go Round is now a retail distributor of Comfy Fit Harness! I believe Comfy Fit is a superior synthetic harness, custom made to the measurements of your equine. Delivery time is usually within 2 weeks once your order has been placed. In addition to harness, we also carry all of their other products, nose buckle halters, kicking straps, spares kits, number holders, reins, marathon safety belts, etc. Check out the harness section on this website to more detailed information about Comfy Fit Harness.